Laid-Back Tom 75-piece puzzle by Buffalo Games. 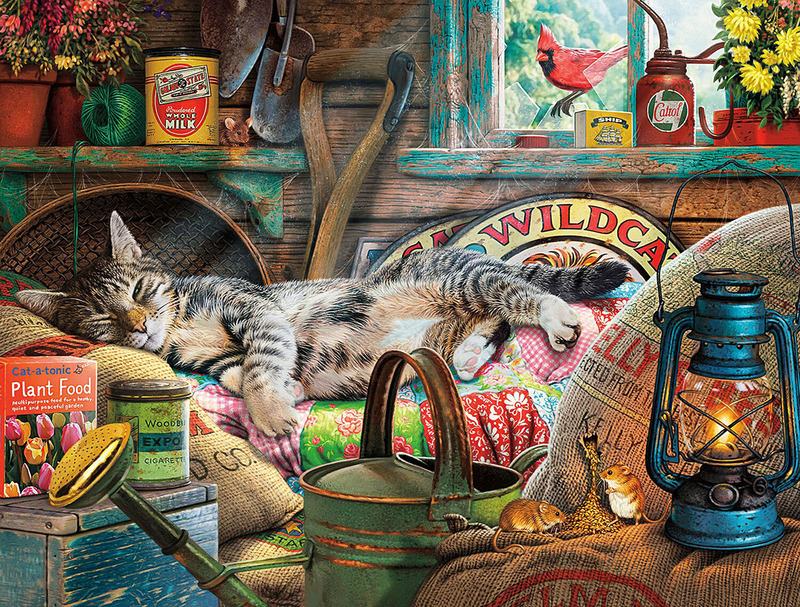 Laid-Back Tom, from the 750-piece Cats Series by Buffalo Games, is a highly detailed jigsaw puzzle full of rich, vibrant imagery. The scene showcases Tom, quite possibly the world’s most easy-going cat as he stretches out on his favorite quilt in the gardening shed. One tired squinting eye catches the soft afternoon rays of the sun that shine through the window. Typically irresistible cat temptations are but a paw’s length away. Perched on the fractured window pane sits a bright red Cardinal. Mice enjoy a cascading stream of seeds from the burlap bag they worked their way into. Another mouse sits perched on the shelf above Tom, ready to join snack time. Not even a dangling ball of garden twine can tickle this kitten’s curiosity. For ages 14 and up. Puzzle measures 24" x 18" when completed.